Strategies to get consumers singing their praises. A few years ago, online ordering company Seamless ran an ad that read, “Happiness is ordering food on your phone without saying a word.” For many people these days, happiness is telling Alexa or Google to order food. Thanks to voice-based virtual assistants like Amazon’s Alexa, Apple’s Siri, and Google Assistant, mundane tasks like ordering a pizza, creating a shopping list, or searching for flights can be delegated to a tireless assistant. It also unlocks a new form of “always-on” interaction between consumers and brands that is a game-changer from a marketing and customer service perspective. But like every experience channel before it, poor interactions may diminish brand value and relationship strength, sometimes worse than if there was no interaction at all. With that in mind, here are some best practices that companies should keep in mind as they dive into voice technology. Was that an ad, Alexa? Although the smart speaker field is still new—Google Home was launched in November 2016 and Amazon Echo was launched in 2014—tens of millions of consumers regularly use these technologies, according to app-measurement company Verto Analytics. Consumer demand for voice devices is expected to generate $3.5 billion by 2021 and brands whose websites support visual- and voice-search will increase their digital commerce revenue by 30 percent, according to Gartner. As this technology becomes ubiquitous, brands have a lot of incentives to monetize their audiences through voice-activated ad experiences. But engaging audiences on a voice-based virtual assistant is harder than it seems. While Alexa and Google Assistant potentially offer brands an opportunity to have a hands-free, frictionless dialogue with consumers, there’s a high chance that advertisements will seem intrusive. Let’s start with search results. Unlike a website page that lists many search results, a voice assistant like Alexa only offers one result at a time. For instance, if an individual were to ask Alexa for an apple pie recipe, the assistant would lose credibility if the first recipe it shared was a paid option. Moreover, a paid result isn’t necessarily the most relevant one, which would further undermine Alexa’s usefulness. It’s no surprise, then, that Amazon and Google are moving slowly when it comes to introducing ads to their virtual assistants. Amazon allows brands to create third-party apps called skills on its Alexa platform. Consumers can select branded skills, and say, “Alexa, tell Seamless to reorder my last order.” As of this writing, developers had already created more than 30,000 skills for Alexa, according to Amazon. Another option, is to offer an exclusive promotional price or discount through voice orders. “For example, Amazon is pushing Alexa-exclusive offers that are only available through voice ordering,” Zhou says. Meanwhile, Search Engine Land reports that Google recently introduced paid voice search to Google Assistant through a partnership with local home service providers like HomeAdvisor and Porch. When searching for a plumber, for example, an individual could say, “OK Google, find me a plumber.” After confirming when and where the plumber is needed, Google Assistant would then provide a list of local plumbers. It’s unclear though, how providers are prioritized or presented for a given query or what percentage Google will collect as its share of the lead price. Customer support that’s delivered in real time via a customer’s preferred device has become a standard expectation across industries. And while technology has delivered time-saving methods for providing support with chatbots and IVRs, the results are occasionally subpar. Chatbots that can only understand simple scripted conversations are frustrating and more hassle for the customer. So while employees may not be asking Alexa, Siri, or Google to set timers, make dinner reservations, or set the thermostat, they may want their assistants to pull up GPS directions, manage schedules, and enable a number of other hands-free operations during their time on the clock. And depending on the company, utilizing voice commands in an enterprise setting could require multiple apps and configurations of local, external, and cloud resources. Various apps and resources may need to interact to support workflows that can be relatively simple or very complex. For instance, an enterprise version of Alexa’s skills would allow employees to add voice-activated capabilities that become part of the tools used in the workplace. In fact, Amazon already has an “Alexa for Business” offering, which lets companies buy Alexa devices through a subscription. The devices help employees dial into conference calls, manage their calendars, and of course, order work supplies from Amazon. In the contact center, voice-based virtual assistants can field initial customer support requests and resolve simple tasks, freeing up associates to focus on more complex tasks. These technologies can also be integrated into IT service desk solutions so that an employee seeking IT support communicates first with the artificial intelligence and is only directed to a human associate as a last resort. We’re not quite there yet, Marcoux adds, since the devices would need to integrate seamlessly and so far, Google, Alexa, and Siri don’t play well together. But it’s not difficult to imagine humans taking on a more supervisory role while the virtual assistants handle daily tasks. Technology is already getting better at deciphering sentiment and emotion. “I would love to see the technology evolve to when the bot detects user frustration, there is a process to immediately engage an associate,” Zhou says. Voice-based virtual assistants present a great opportunity to better engage customers, but they should be only one layer within the customer experience. The ideal experience would be a natural transition between automated self-service technologies and human associates. 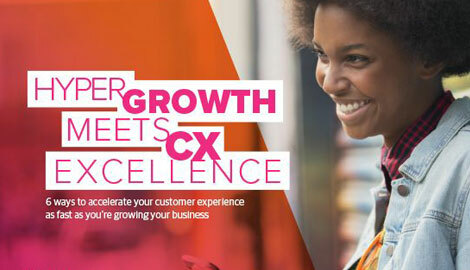 As customer expectations for great service remain high and pressures continue to increase, delivering a great experience will be crucial for businesses. If done well, voice-based virtual assistants provide an opportunity to make experiences faster and more efficient—yet still human.